So, our first night wondering the streets of Vientiane; a drink at Blue Sky Bar, walking around trying to find a hobo (or more detailed) map to orient ourselves, kindof getting semi lost – but not really as Vientiane is not that big and the streets are easy to navigate, finally stumbling in to the Hare and Hound English style pub for a late(ish) dinner. Interestingly, the Hobo map that I bought later showed the Hare and Hound to be near Maxai temple, but was up near the Lao Plaza hotel. At this stage we realised that the little map we were given wasn’t all that useful and didn’t show very much detail. 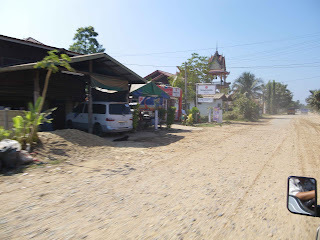 So we were basically just wondering blind and hoping we could find our way back to our guesthouse by heading south and just finding the Mekong, which we knew would eventually lead us to Impeng road. 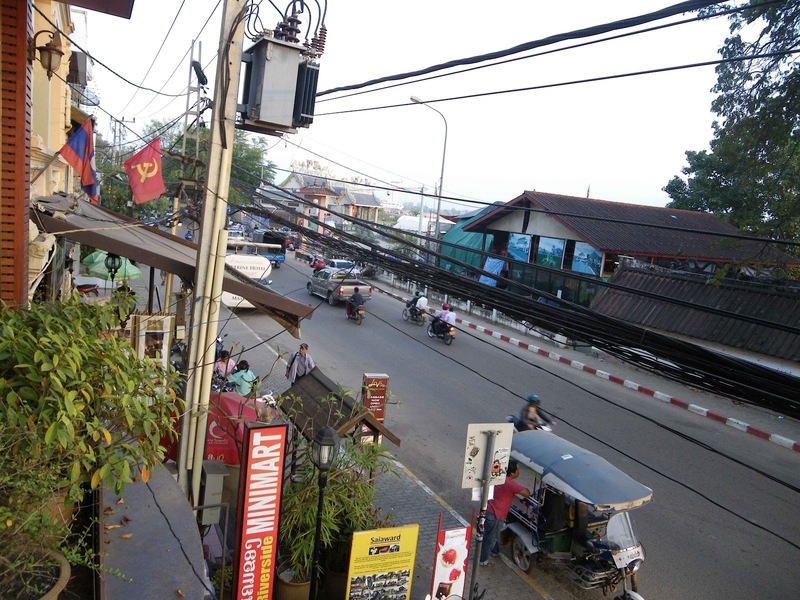 The morning started reasonably early (after a reasonably early night once we successfully found our way back, map-less, after a few beer Laos). As soon as we appeared on the veranda of the little cabin, our hostess brought freshly brewed coffee, croissants, and fruit for our breakfast. Consulting our travel-weary copy of Lonely Planet, I set a course to wonder up along Setthathirath Road to see some temples and take in some sights. 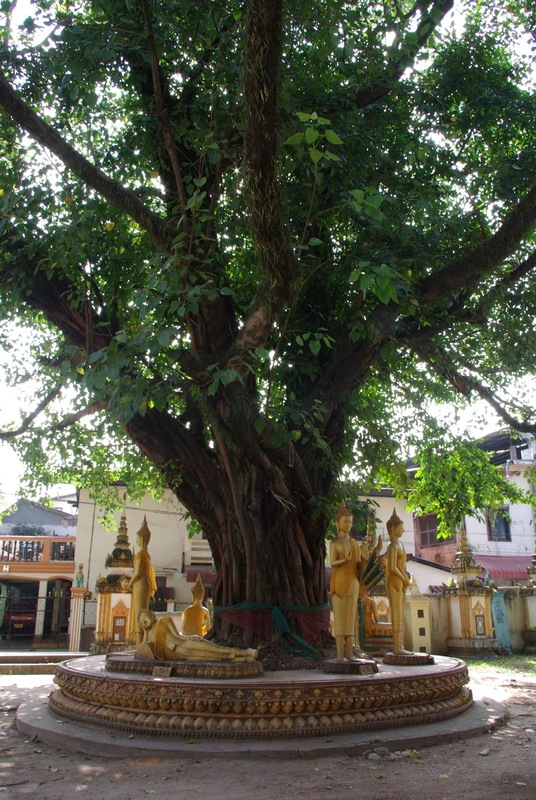 It’s hard after Chaing Mai and Luang Prabang to ‘temple hop’ and not become blasé. But I did OK and found each temple to have unique features to be appreciated. We visited (in order) Wat Impeng, Wat Ong Tue Temple, Wat Haysoke and Mixai temple (which was the only one we found not open). We found ourselves to be the only westerner visitors, and pretty much had each temple to ourselves, save some local monks cleaning or preparing for the next prayer session. With a small bow, hands pressed together, and peaceful smile, I tried to greet them respectfully, and was warmly greeted in return. A few words spoken in English; “Hello. How are you? Fine thank you. Where are you from?”. Much smiling. Some younger monks giggled as they tried out their English. Really, I could have spent the whole day popping in and looking at all the temples in Vientiane, but I think J would have abandoned me. We headed along the road to find lunch. Up ahead, a group of westerners were consulting a map. Hang on. Isn’t that... the boat people? We drew closer and confirmed that sure enough, there they were. They were so busy with their map and plans that they didn’t see us coming. “Anyone know where to get a good feed around here”, I said loudly as we approached. Mr R and Mrs S, and Mr J and Mrs L, turned around and laughed. We exchanged stories about what we’d seen, where we’re staying and our trip from VV to VT. Once again, we ribbed each other about not being able to escape them. After a chat and a few tips, they recommended JoMa cafe bakery. J and I bade our ‘see you laters’ and crossed the busy road to enjoy some air-conditioned comfort with an excellent lunch. We didn’t see our ‘boat people’ again. 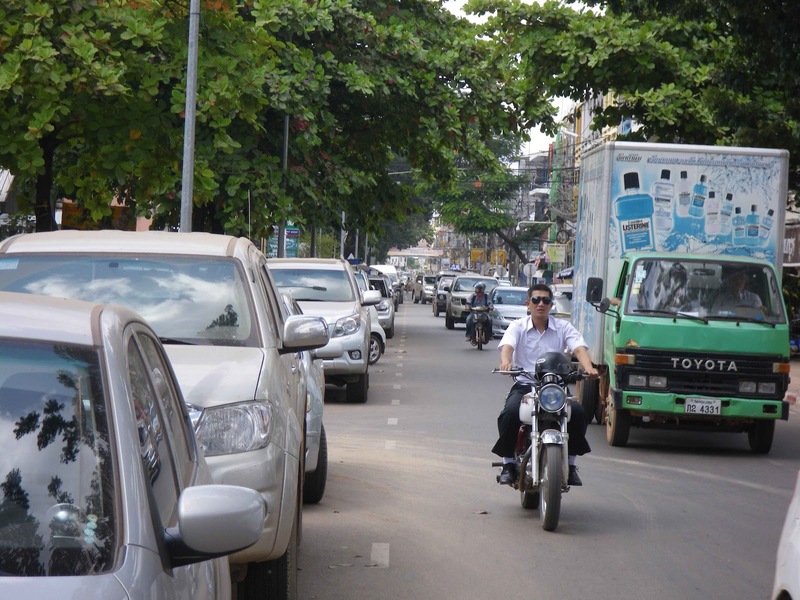 Satisfactorily full and cooled down, we meandered along Setthathirath Road towards the Presidential palace. 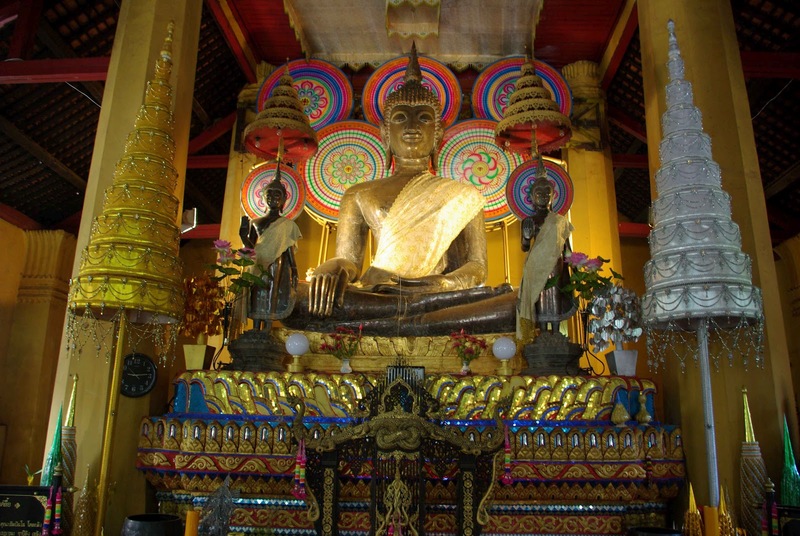 Another temple - Wat Si Saket was my destination. 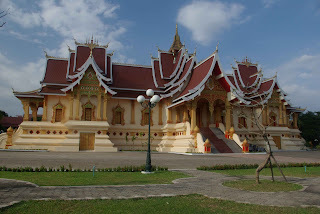 Unlike the wats we visited earlier, this temple was built in a Thai style. We spent most of an hour exploring the temple and grounds, including a quick incense offering. 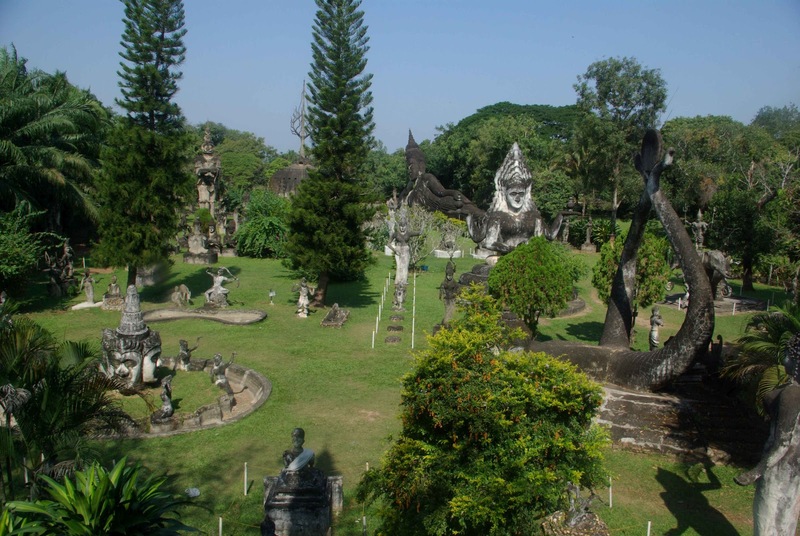 From there, we crossed the road to Wat Haw Pha Kaew and enjoyed another hour or so wandering around the beautiful gardens and the museum. There were many relics and artefacts on display that were very interesting. Not to mention how nice it was to be out of the sun. Consulting the map, That Dam – the black stupa – wasn’t far away. Crossing over Lane Xang, which is the Vientiane equivalent of the champs elysees, we took a few back streets to the wonderful ancient stupa perched right in the middle of a suburban round-a-bout. Though it wasn’t far between stops, it was seriously hot. Luckily there was a great little cafe across from the large black monument. Au Bon cafe was lovely and made a mean lemon juice. After our yummy cold drinks, we were off again. 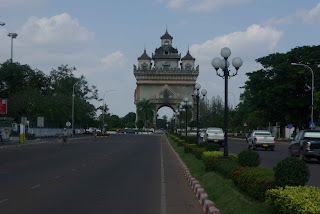 We had no intention of walking the whole way, but we found ourselves enjoying the street scene and soon found ourselves at Patu Xay, the Vientiane equivalent of the arch de triumph. It’s a bit of a white elephant, but a must see. Surrounded by beautifully maintained gardens, and hundreds of locals and tourists, it stands in the middle of the double lane, divided road. Looking down, and/or up, the stately thoroughfare, you sort of felt you were in Paris, or somewhere in Europe. I kind-of liked it, but also kind-of thought it was the epitome of kitsch. Really, it is a bit showy and gaudy. Nevertheless, it just has to be done, and we had a cool drink as we walked around the grounds. 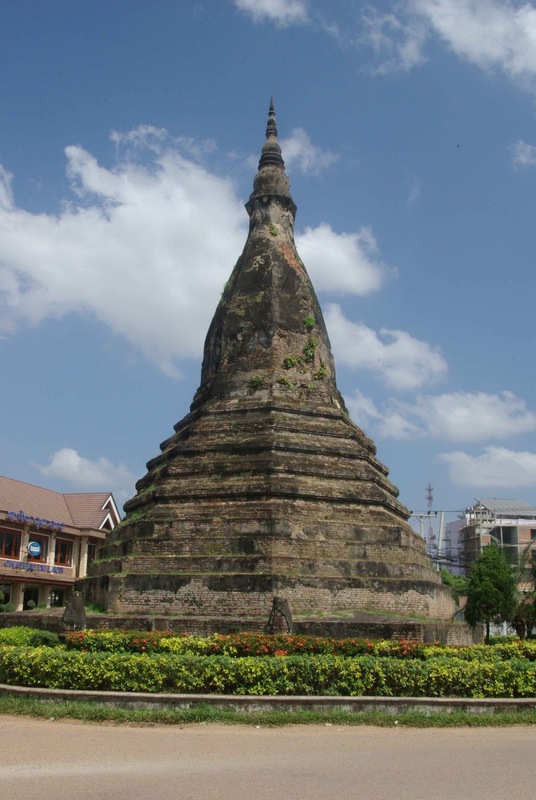 Seeing how far we had walked to Patu Xay, and after checking the map, I discovered it was that distance again to Pha That Luang – the great sacred stupa. I looked at J and he gave me a look of warning, ‘if you think for one minute we’re walking all the way up there, you are out of your mind, and I’m not coming”. Without saying a word, I lead J over to a ‘taxi’ stand, and negotiated a cheap fare up the road. The breeze in the back of the truck-jumbo-taxi thing was refreshing, and we were there in a matter of minutes. To start with, you couldn’t see it. From the main road, Rue 23 Sinhga, we were dropped at what appeared to be a market that was in a state of flux. Half the stalls looked to be packing up, while some others seemed to be just setting up. I think the driver indicated that there was some sort of festival on, but I couldn’t make out what he said. After a few steps, the golden glow was clearly visible. What a magnificent sight! Behind a bland wall sat the brilliant, gold plated stupa in all its glory. It was late in the afternoon and the shadows were growing long. But the sacred shrine glowed in the fading light. It seemed to be lit from within. We paid the entrance fee before venturing in and looking around. Despite all its dazzling gold, it really is a bit boxy and characterless. But it held the solemn air of a sacred place, like a grand European cathedral. Many locals were praying and making offerings. We walked around the lawned permitter before heading off. 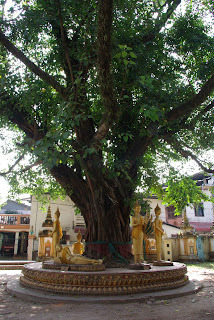 Right beside was a large temple, Wat That Luang, which I found stunning. It was pretty much deserted and closed. In the late afternoon shadows, we quickly walked around the paved grounds before making our way back to the road and catching a ride back to our hotel/guesthouse. As usual, I was starving, and ready for a beer. J was ready for a lie down. Poor J. I told him he could rest later... A quick rinse, change of clothes and we were back out to the dusty streets to track down a cold one. Instead of meandering directionless, we headed to the main road running parallel to the river, Fa Ngum. There are lots of bars and cafes and we checked out a few before deciding on a beer in the shady outdoor area of the Tex Mex place. J and I are obsessed with finding Mexican food wherever we travel. But tonight was not the night. I was keen to explore and have a really nice meal in one of the more highly regarded restaurants. Walking around the block we reviewed a few menus and checked out a few places, many completely empty, but we chose Aria. It looked cute, with some quaint outdoor tables, and had a few tables of patrons – always a good sign. The prices seemed pretty expensive by Lao standards but as it turned out they included a glass of prosecco (an Italian white wine) and a plate of mixed breads with flavoured butter. The food was heavenly. We spoilt ourselves with an indulgent three course meal and a nice (expensive) bottle of wine. Sitting out in the cool of the evening, watching the passersby, enjoying a fine meal, well, it doesn’t get much better than that. Following our amazing meal (which was by far the most expensive in Laos, but still less than half of what you’d pay for an equivalent meal in Melbourne), we headed back down to the main road along the Mekong. 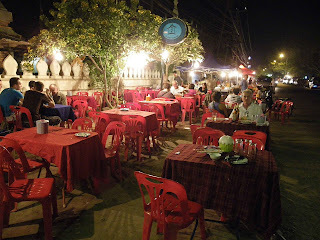 In front of Wat Chan, a night food stall was set up filled with mostly locals and a few hardened backpackers. The meals are cooked over little gas burners with little or no refrigeration for the meat and veggies going into the dishes. Rows of bright red, plastic tables and chairs were set up, with red chequered tablecloths. A slight breeze came up from the river. 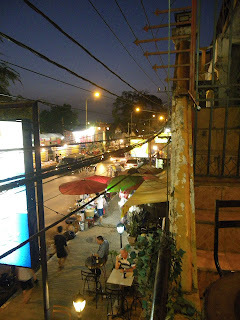 Across the road, the night market was in full swing, selling mostly touristy wears. Poor J was dragged through for a quick look before we enjoyed a beer at one of the red tables. Sweet and savoury smells wafted around us, as locals enjoyed their fragrant stir fires and noodle soups. With a beer in hand, sitting at a table watching the traffic go by and the night time life of Vientiane, I mused with J about how small the town was for a nation’s capital city. 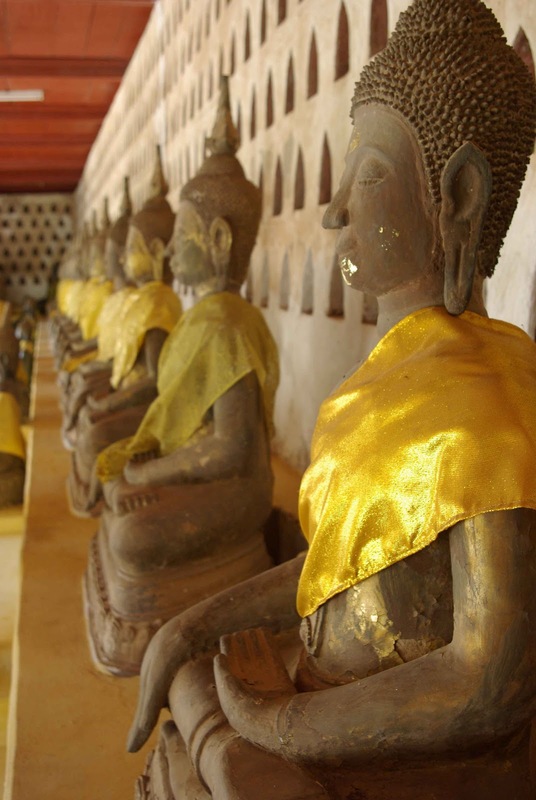 Another memorable day in Laos. Another glorious day greeted us as we ate our simple but filling breakfast on the porch of our bungalow at Auberge Sala Impeng guesthouse. With only one last full day left in Vientiane, I was very keen on going out to Buddha Park. A jumbo/taxi driver approached us the minute we left the gate of the guesthouse. We negotiated a fair price (which I can’t recall now but was very reasonable) and we were off in the back of the truck-come-van vehicle through the streets of Vientiane. Traffic wasn’t too bad. Though busy, our driver navigated through and around the worst snarls. Within ten minutes, we were heading out of town down a long, dusty highway. Along the way, we passed lots of road side stalls and shops. We passed under the Friendship Bridge, which you cannot miss. It’s massive. Not far beyond that, the road deteriorated to a bumpy, dusty series of potholes. J and I laughed as we bumped along, enjoying watching the local scenes of daily Laos life. Thankfully the road improved after a few kilometres and we soon found ourselves at Buddha Park. Turned out, we were the only ones there. A small group left just as we arrived so we had the place to ourselves. What a quirky place! 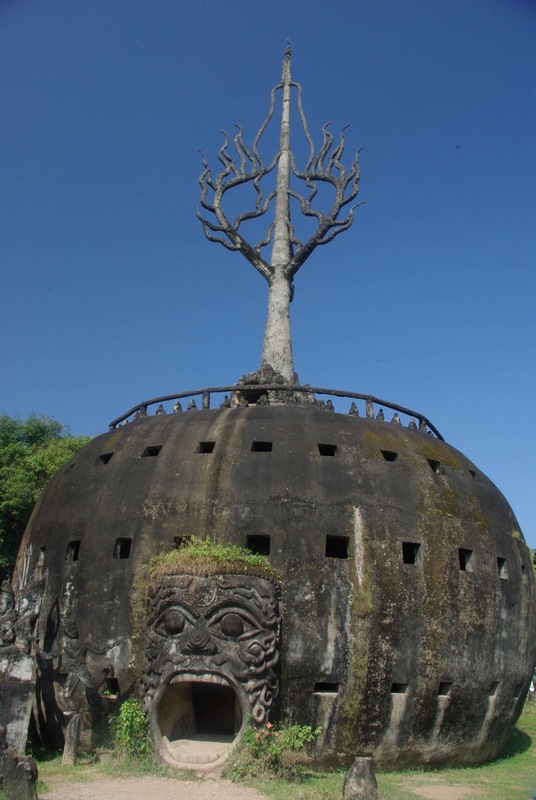 A large Yama like structure beckoned us to enter inside through his large gaping mouth. Inside was dark but you could make out hundreds of smaller statues of various Hindu Gods and Goddesses. We explored within, climbing the precarious, narrow stairs between floors, and ventured out onto the roof, where there was a nice view of the park and glimpses of the river beyond. The park has many large Buddha statues, as well as many of the other ‘major’ Hindu Gods. We walked around taking many photos and just marvelling on the scale of the place. Though a bit weird as all the statues are concrete and not exactly historical or sacred, it was a true highlight and a very interesting and enjoyable way to spend a few hours. Watching the scenery go by on the way to and from made the trip even more worthwhile. Returning to Vientiane city, we made our way to Talat Sao shopping centre. We first explored some of the streets and shops around the outside, selling everything from beds to saucepans to motorbikes and even the kitchen sink! However, the midday sun was starting to become unbearable so we entered the air-conditioned comfort of the mall. I can’t say I was very inspired with the shops. A few clothing stores, jewellers, knick knacks, electronics etc. But I did buy a lovely bracelet (which is now one of my most cherished pieces). It is a simple silver band with many tiny coloured beads inlaid around the circumference. The beads look like mother of pearl, lapis, topaz and coral, but I don’t think they are precious stones or anything. It’s just a unique piece that I have not seen anywhere since. It was the most expensive thing I bought in Laos for about US $100. Next on the agenda for our last day was the National Museum. 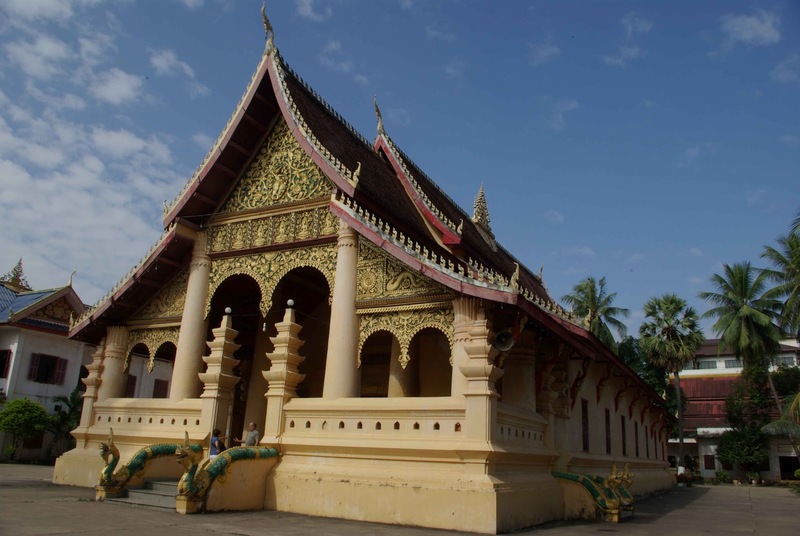 Different rooms over two floors held many displays relating the history and culture of Laos. We spent an hour reading through all the interesting information and enjoying being out of the heat of the day. Some labels were too faded to read, but there was a lot to see. It felt a bit like being back in the 70s with the musty floorboards and fans trying to keep the air circulating in the stuffy rooms. Definitely worth the time to understand more about Laos, its people and history. The rest of the afternoon was spent wondering the streets of Vientiane, visiting many shops, stopping for cool drinks, and snacking. One standout was Via Via, where enjoyed a lovely afternoon tea. We would have returned for dinner that night, but it was Mexican night at the Tex Mex (which turned out not to be that great – but – as has been said before – had to be done). As far as shopping went, I purchased a number of indigo dyed pillow cases and little purses to give as gifts. But not much else. 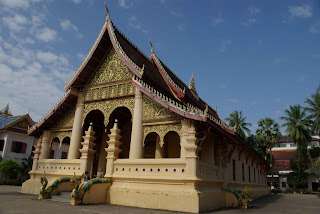 I’d done most of my shopping in Luang Prabang and I’m not a massive shopper on any account. By late afternoon, we’d explored (I’d say) all the main streets and side streets of Vientiane, and our feet were tired. So back to our gorgeous guesthouse to relax before dinner. 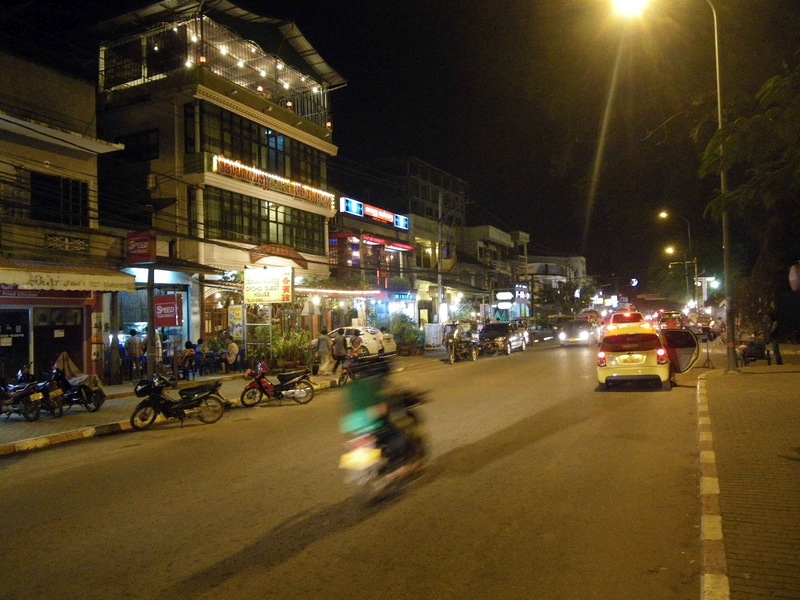 Our last night in Laos. It came too fast. We had an uninspiring Mexican-like dinner at the Tex Mex. The best part was having a table upstairs on the outdoor balcony to enjoy the night breeze and watch the street scene. For that reason alone, we hung around and an extra beer before leaving. We walked along the Mekong river, where there was a Chinese Opera and some sort of temple set up. After looking around, we strolled up to the market stalls, where I made a few last minute purchases of an indigo dyed, fabric gecko, and a gorgeous hand stitched bag made from various hand woven materials. One stand, “Make Bracelets, Not War” attracted my attention. The bracelets are made from aluminium that was formally part of a plane or bomb dropped on Laos at the time of the Vietnam war (often called the secret war). The villagers were taught how to make new meaning from the bombs and to escape poverty by crafting cutlery and bracelets from the melted down munitions. All proceeds go directly to the families, so I bought a half a dozen to give to my friends at home. With little kip left in our pockets, we returned to the night time food stand in front of the temple for a final beer or two. The final morning was spent packing up ready to fly to Kuala Lumpur, where we had a brief two night stop before returning home. Our flight was in the afternoon so we had time for a last wonder around and an enjoyable lunch at the Full Moon cafe. 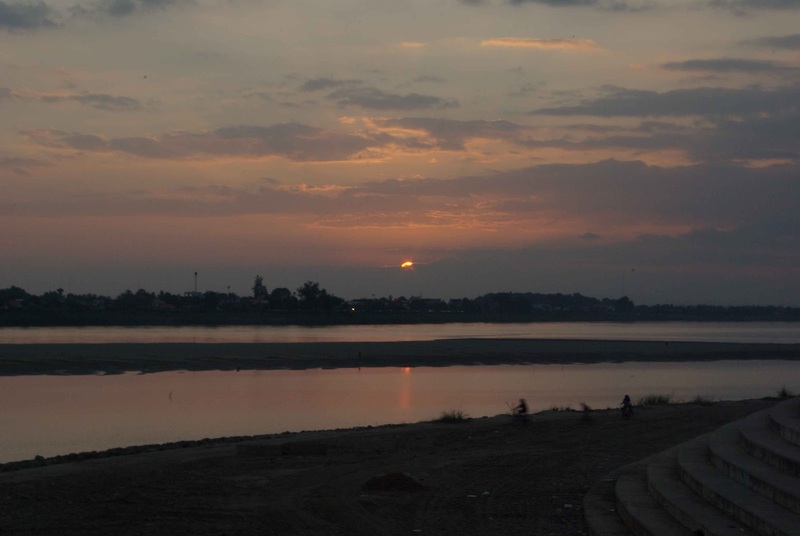 It was sad to leave Laos. Our mood was a bit down, and it was hard to look forward to our stay in KL. Vientiane was lovely, but after our full two and bit days there, it was enough. 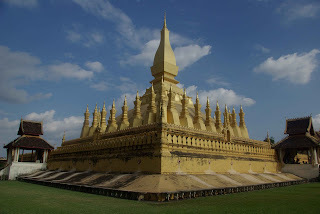 I regretted not planning more time in Luang Prabang and Vang Vieng. 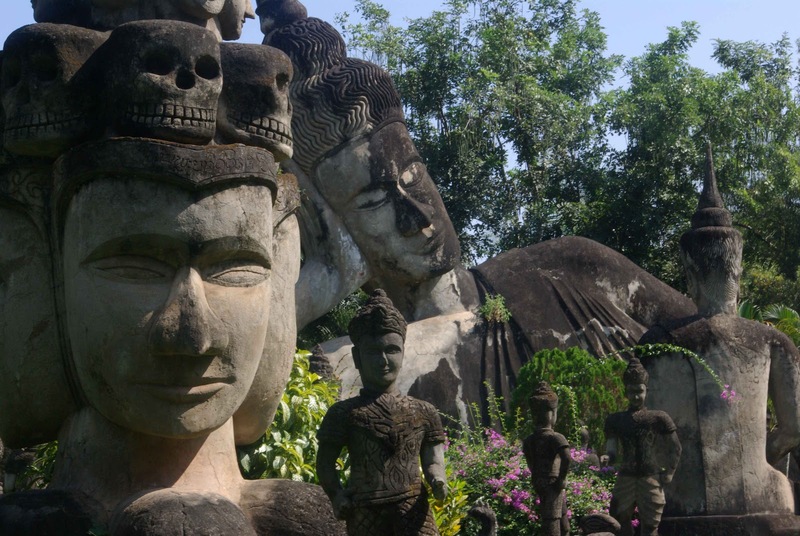 But now my thoughts turn to my next South-east Asia trip, where a return to Laos is highly possible. Thank you Laos, for a most memorable experience. Your people, your country, your warmth made me feel totally at home. I hope to return soon and explore more of your wonderful country. An interesting, well written report. The Hare and Hounds no longer exists, (unfortunately), and has become a Tapas restaurant. There is also a much better Mexican restaurant that has opened in Ban Sokpaluang.